Our Media Resource Center enables you to continuously educate your customers, members, and employees about the many benefits and features available to them through EXTO. You may use any of the tools on this page to co-brand with your logo and EXTO. You can also adjust the wording of any of the emails to suit your needs. In addition, if you need us to co-brand any of these documents for you, just let us know and we'll be happy to do it for you at no charge. If you are in need of any media not available on this page, please let us know and we will work with you to create it. We are always here to support you and your organization to reach new heights of success! Share this information on how to access the Perks program from any mobile device. Add this to any email signature to promote awareness of the Perks program to your users. 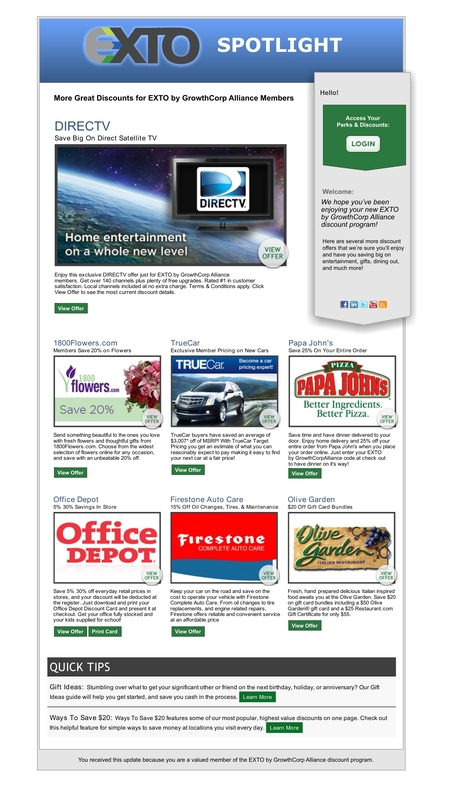 This overview flyer is recommended for use with your initial email announcement. 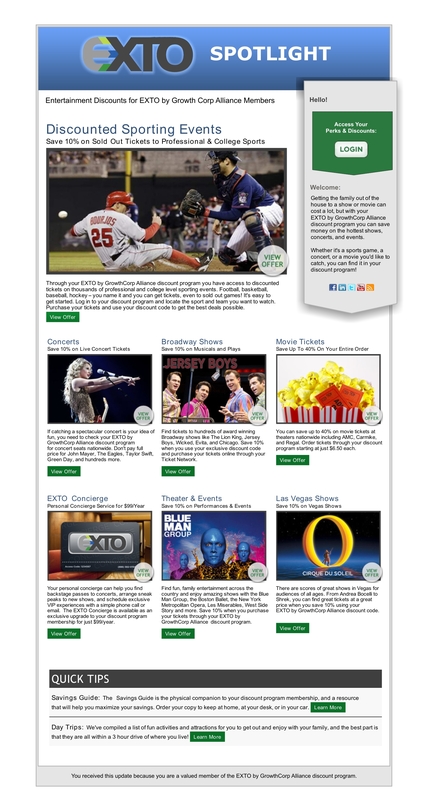 Email designed to be used with the "Introducing EXTO" flyer, you may edit as required. This flyer is recommended for use with the second email announcement to your members. Email designed to be used with the "Payroll" Flyer, you may edit as required. This flyer is recommended for use with the third email announcement to your members. Email designed to be used with the "HRIS" flyer, you may edit as required. This flyer is recommended for use with the fourth email announcement to your members. Email designed to be used with the "Perks & Discounts" flyer, you may edit as required. This flyer is recommended for use with the fifth email announcement to your members. Email designed to be used with the "Health & Wellness" flyer, you may edit as required. A simple, easy-to-navigate overview designed to help end users understand the benefits of EXTO. Personalize to your own needs, or we will do it for you on request. 1-page overview of signup process. To stimulate interest in EXTO, some Channel Partners offer a bonus (typically $50) to have their members attend a 15 minute webinar, which we are happy to host on your behalf. These emails may be used to promote the webinar. Please coordinate with the EXTO team before beginning a webinar promotion. This short, to the point email has proven effective. Some like to do an A/B campaign where half of their members receive the short version and the other half the longer version. This longer version is favored by some. 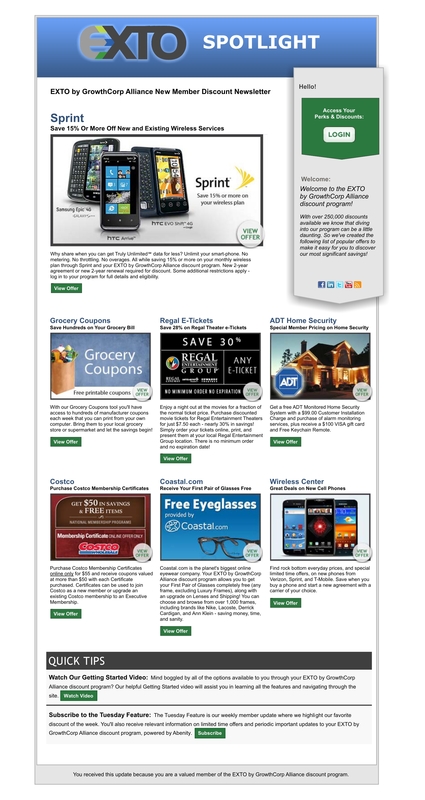 This Perks flyer can be used at any time. If you would like a copy of this branded for your organization, please contact us. This flyer can be used for any email campaign. Automatically generated 2 days after employees onboard. If you would like a copy of this flyer branded for your organization, please contact us. Automatically generated 2 weeks after employees onboard. Automatically generated 6 weeks after employees onboard. Automatically generated 10 weeks after employees onboard. Explains optional benefits and services available through EXTO at discounted rates. A 4" x 6" postcard template that may be used to mail out to your members, or as a hand-out at meetings and conferences. We will customize for you to have printed, or we can arrange to have them printed for you at a reasonable price if you prefer.